This is a story that blessed me. I don't know if it really happened, but if that's going to freak you out, you're missing the point. I hope it blesses you like it did me! "I sat, with two friends, in the picture window of a quaint restaurant just off the corner of the town-square. The food and the company were both especially good that day. As we talked, my attention was drawn outside, across the street. There, walking into town, was a man who appeared to be carrying all his worldly goods on his back. He was carrying, a well-worn sign that read, 'I will work for food.' My heart sank. Then with some hesitancy, I headed back into town. As I turned the square's third corner, I saw him. He was standing on the steps of the store front church, going through his sack. I stopped and looked; feeling both compelled to speak to him, yet wanting to drive on. The empty parking space on the corner seemed to be a sign from God: an invitation to park. I pulled in, got out and approached the town's newest visitor. I felt as if we were on holy ground. 'Could you use another Bible?' I asked. He said he preferred a certain translation. It traveled well and was not too heavy. It was also his personal favorite. 'I've read through it 14 times,' he said. Today his gloves lie on my desk in my office. They help me to see the world and its people in a new way, and they help me remember those two hours with my unique friend and to pray for his ministry. 'See you in the New Jerusalem,' he said. Yes, Daniel, I know I will. Prayer is one of the best gifts we receive. There is no cost but a lot of rewards. Let's continue to pray for one another. God bless and have a nice day! Father, I ask you to bless everyone reading this right now. Show them a new revelation of your love and power. Holy Spirit, I ask you to minister to their spirit at this very moment. Where there is pain, give them your peace and mercy. Where there is self-doubt, release a renewed confidence through your grace, In Jesus' precious Name Amen." 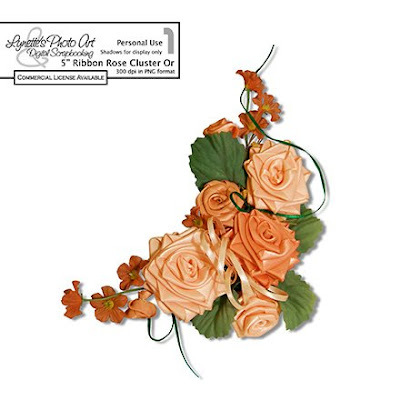 I am giving this Ribbon Rose Cluster to you in eight different color combinations. If you miss any they will be in the archives in the left column. Thank you! Your blog post will be advertised on the DigiFree Digital Scrapbooking Freebie search engine today (look for timestamp: 05 Feb [LA 07:00pm, NY 10:00pm] - 06 Feb [UK 03:00am, OZ 02:00pm] ).